"Vad är du rädd för?" Translation:What are you afraid of? Is this the correct pronunciation? To me it sounds like the the 'd' drops from 'vad' and I hear a long 'a' between 'v' and 'r' (so it becomes something like "vaar du rädd för?"). Not sure if you're on the new TTS or not - I'm still on the old one, and she clearly has a d. In either case, dropping the d from vad isn't so weird to me. I do it all the time (although perhaps incorrectly!). I would go as far as saying that the -d in vad is silent. This sentence with the new TTS sounds like Va ä du rädd för which is pretty much how I would say it. Interesting. That means that Norwegian hva and Swedish vad, with their silent letters, are actually pronounced identically! Yes, in Swedish it was spelt hvad until 1906. Can't wait to get the new TTS. That pronunciation sounds about right to me, too! so I presume jag är rädd för dig means "I am afraid of You". How could one say i am afraid for You? Is "What are you scared for" not acceptable? While "of" would probably be my go-to in English, "for" doesn't sound wrong per se. That really means "why are you scared", which is a slightly different question. I guess you could argue it also means "what are you worried on behalf of" but that's even more different! Would "Vad är du rädd av?" also work? Is there a post or can you elaborate on when to use words with the same meaning like av and för? Well, prepositions are very irregular in all languages that rely heavily upon them, English included. Although I suppose there are general patterns or guidelines, I'm afraid learning what prep to use with which verb is a matter of learning it by heart. What does rädd become in the case of an ett word? Rätt? There actually isn't a neuter version of rädd, which is very confusing to natives as well. Yes, that's correct. Rätt is correct for a neuter/ett word. I don't know why the other person said it isn't. It is absolutely not correct in practice. While it's not technically wrong to use rätt like that, it is not used by natives and should not be taught to learners. In theory, it should be possible to inflect rädd like that, but that is usually never done. Another word is used, or the the whole phrase is rewritten, e.g. as ett skrämt barn. [...] From a language cultivation perspective, there's nothing remarkable about forms like rätt and morbitt. They're just never used by anyone. My partner, who is a native, and is sitting beside me, says otherwise - that it is correct, i.e. "Ett rätt djur". Language changes - outside of "rules". That's what linguistics is. Wiktionary also says rätt is correct. So it is in usage and is somewhat accepted. I am a native, too, and I trust the Swedish language council's advice. You do realise that Wiktionary quotes the same page as I did? From Wiktionary: "The language council comments on the neuter form rätt and ascertains that it is not wrong, but that it just isn't used." Again, it should not be taught and it is not in common use. Edit: The above comment has been changed since I replied to it. It said something else originally. I wrote 'Why are you afraid?' - is this too different? Yes, why are you afraid means varför är du rädd, but Vad är du rädd för? asks what it is you fear. I realise this is a very late response, but yes, that works fine - provided you say mitt liv, since it's an ett-word. :) It could of course mean "I'm afraid of my life" as well. You use the neuter ett-word form with living things only if you used an ett-word noun to describe them. For instance, barnet är sött, but just han är söt even if han is a child. Ett barn = barnet är sött who h i understand but why did Han take the en- version of söt is living things should take ett-? Is Swedish as fastidious about placing prepositions at the end of sentences as in English? But some people complain that what the Knight really says is: "Min kropp beredd, inte jag själv." (My body is prepared, but I am not) Which is the opposite of what the English speaking audience is getting. I read it online, but it was probably ten years ago or so, so I'm afraid I don't have a link. rädd makes so much more sense. And I honestly think that's what it sounds like too. His handwriting is sort of surprising, the curliness doesn't really fit in with what I've heard about his personality. I was surprised too! This is like a doctor's handwriting not an artist's, isn't it? It is quite chaotic. I don't know what it means. What kind of personality do you think he had, according to this handwriting, Arnauti? @myriam365 Whether or not you use dashes or dots for the umlauts mostly just depends on your personal handwriting. When I write in cursive, which is my personal handwriting, I use dashes, but when I write in non-cursive for example for my printed name I use dots. Å always has a circle on top though. 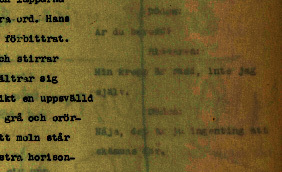 Wow, I think I just found a photo of the original script: http://www.ingmarbergman.se/verk/riddaren-och-doden And it says "beredd"!! It says Nej jag är inte beredd in your picture, and he definitely does not say that. The audio sounds like its saying, "Why do that for?" Please refer to the above discussion on that. I can't hear the är. It sounds like: Vad du rädd för. Myriam and Arnauti, I don't find his handwriting surprising. He was a 4w5 in the enneagram according to Don Richard Riso and I am a 5w4 which is the same but with different emphasis. I don't think doctors write like that at all. He definitely has an artistic-intellectual temperament from his handwriting. Is it me or the TTS is saying "vad du rädd för? "?